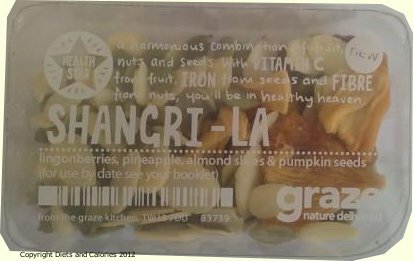 There were no new snack punnets in my Graze box last week. But I’m not complaining. Everything in there has been tried before and all were rated LIKE or LOVE which means we're more than happy to get them again. Just for the record, last week’s delivery included: Fruit and Seed Flapjack (week 3) which is probably everyone’s favourite snack in my household; The Herb Garden (week 7) – tasty low calorie rice crackers; Bounty Hunter (week 2) – a mix of coconut flakes, dried cranberries and milk chocolate drops and the fourth snack was Fig and Cherry Fruit Bake (week 9). 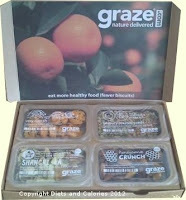 Onto the latest delivery and this week I received two new snacks in the Graze box. 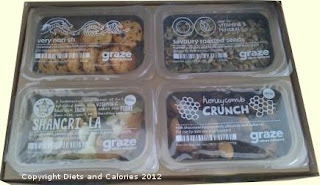 Not only are they new to me, they’re completely new to the Graze range. Eleanor, one of the Graze nutritionists, has developed 10 new snacks in time for Spring. And this week I got two of them. They were Honeycomb Crunch and Shangri-la. And old favourites also in the box included Savoury Roasted Seeds, reviewed here and Very Nori-sh, reviewed in this post. 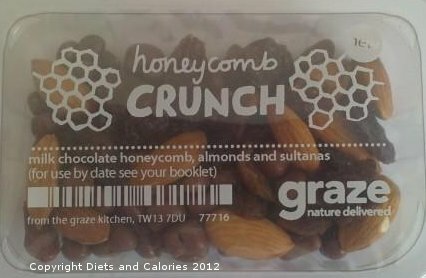 Honeycomb Crunch contains a selection of three nibbles – sultanas, almonds and tiny milk chocolate covered pieces of honeycomb. This is a good range to snack on with the soft, sweet chewiness of the sultanas providing a contrast to the crunch of the nuts. There are lots of little chocolate honeycomb pieces with a crunchy, sticky centre and smooth chocolate outside. They're perfect for when you need a chocolate fix. Although they’re only tiny, you can make them last ages by eating them one at a time. Well I can. Everyone else just grabs them by the handful, not quite appreciating the finer qualities of these tiny treats. 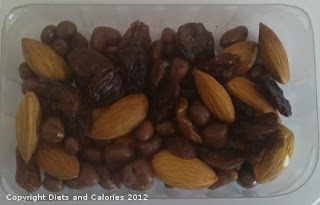 This snack is a good mix of healthy with a little bit of indulgence from the chocolate honeycomb. It has 2g of fibre and 16.6g of sugar, 4g of protein and 10.2g of fats (2.7g sat fat). It also has a shelf life of a month. I’m giving this snack a rating of Like as we’d all be quite happy to see this one again. Calories for the punnet: 187. To me, the name Shangri-la conjures up thoughts of some sort of tropical paradise. With this in mind, I was looking forward to trying this snack out. 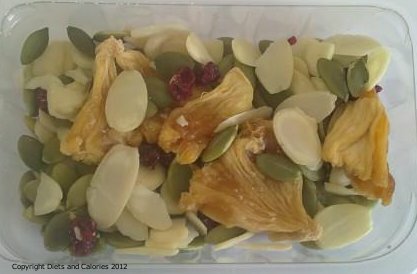 There’s quite a selection in here with four different ingredients: blanched almond slices, ligonberries, pineapple pieces and pumpkin seeds. Slicing an almond into slivers like these would be impossible to do at home. But this is a useful way of making an almond last longer and they were lovely and fresh and crunchy. The pumpkin seeds too, are delicious. In this mix they're simply plain, rather than roasted or seasoned and there are plenty of them to go around. Ligonberries are totally new to me. In fact, I’d never even heard of them. Looking in my little Graze nutrition book, it says they are from the forests of Finland. It’s hard to say what these minuscule red berries actually taste like because they’re so small. I can detect a slight sweetness but nothing too obvious. And finally, the dried pineapple pieces. I wasn’t looking forward to these. Much as I love fresh pineapple, its dried form has never appealed to me. However, I was pleasantly surprised after biting into these. They’re quite tough and chewy, but with an intensely sweet pineapple flavour. This mix has 2.2g of fibre, 8.3g of sugar, 4g of protein and 8.3g of fats (1g sat fat). It also has a shelf life of round 6 weeks. Overall, this was an interesting snack and I wouldn’t mind this being delivered once in a while. Therefore, it gets a rating of Like. Calories for the punnet: 133. 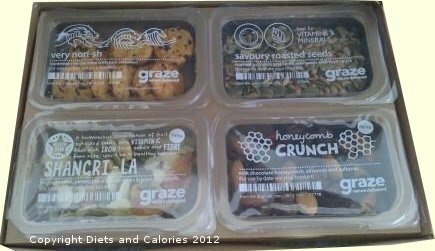 If you’re keen to try out a Graze snack box for yourself, you can order one completely free using this code: 9HZTPXFD. All you need to do is log onto Graze, enter your details, choose your type of Graze box and enter the special code (9HZTPXFD) for your free box. You’re not committed to an ongoing delivery. In fact, if you don’t want any more, you can stop further deliveries as soon as you like. But from my experiences, I’m sure you’ll be as wowed by Graze as thousands of others like me. This post provides an outline to how the Graze system works. For more Graze reviews, click here.